Approximately 700 credit unions offered education financing as of year-end 2016. 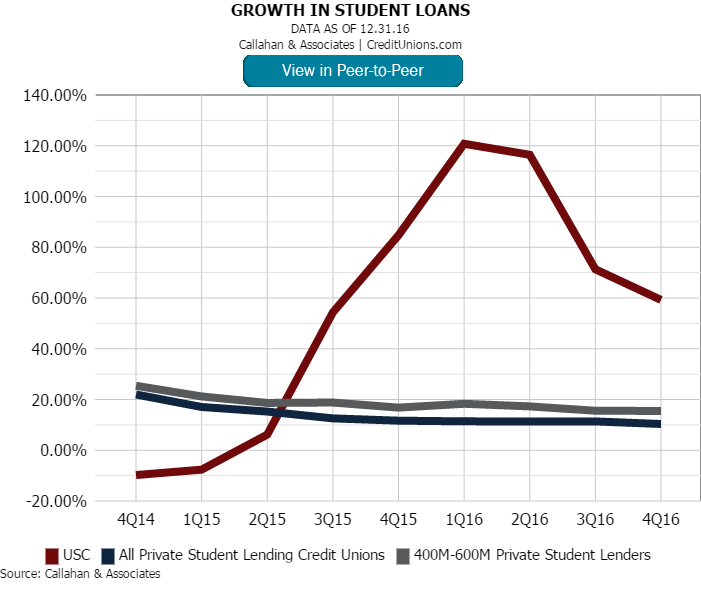 And based on performance data from credit unions representing more than 96% of the industry’s total assets, USC Credit Union ($475.0M, Los Angeles, CA) has posted the strongest performance in portfolio growth in private student lending. The 68,589-member cooperative increased that portfolio by 59.24%, year-over-year, as of fourth quarter 2016. The average among the 59 credit unions in the $400 million to $600 million asset class that offered student lending was 15.48%. 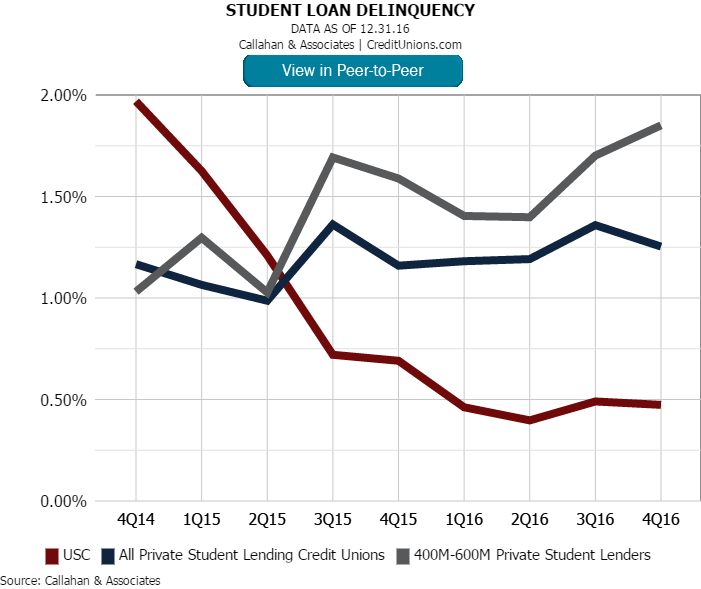 The 708 credit unions nationally that offer private student lending posted a fourth quarter growth rate of 10.34%. A group of facilities employees at the University of Southern California created USCCU in 1972. The credit union hired its first paid manager in 1975 and grew from $2 million to $16 million in assets in the 1980s. USCCU opened membership to students in 1997 and now uses its natural advantage as an on-campus credit union to help drive its student lending business. Running a student lending program? Dive deeper into the data you see in this article with Callahan’s Peer-to-Peer software. Learn more. As of year-end, private student loans at USCCU totaled $25.2 million and accounted for 6.6% of the credit union's total loan portfolio. For USCCU's asset-based peer group, those averages were $7.7 million and 2.3%, respectively. For all student lending credit unions, they were $5.5 million and 1.0%. USCCU’s delinquency ratio, meanwhile, was 0.47% in the fourth quarter, down from 0.69% in the same period in 2015. That’s sharply lower than the industry average of 1.25% for credit unions nationally that offer the product and 1.85% for the credit union's in USCCU's asset-based peer group. According to the USCCU website, the credit union's Collegiate Choice student loan program currently offers rates as low as 3.24% and gives borrowers three choices to repay loans: deferred, interest only, and immediate repayment. Borrowers can apply for loans online, and USCCU returns decisions in as little as 15 minutes. Workshops and other resources relative to personal finance and money management also are part of the student lending and financial wellness offerings from USCCU.